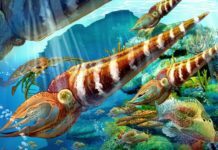 Nestled in the Phanerozoic Eon and more specifically, the Paleozoic Era, the Cambrian Period is a period of time on the prehistoric timeline that runs from about 541 million years to about 485 million years ago. This period is best known for the Cambrian Explosion, an event in which an unprecedented number of multi-celled organisms began to evolve at once. However, all of this life was concentrated in the world’s oceans. At this time in Earth’s history, the land was pretty much barren and lifeless – except for perhaps simple microbes that may have colonized the soil. At the beginning of this period, the ocean floor was covered in carpets of microbial life that would become a food source for early multi-cellular organisms. At the same time, some organisms were developing calcium carbonate exoskeletons and began to build reefs. This continued until about the middle of the Cambrian Period when there was a significant extension event that wiped out many of the species. 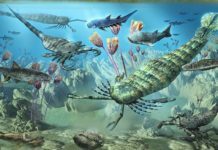 Which opened up a large number of ecological niches and may have set the stage for the Cambrian Explosion. 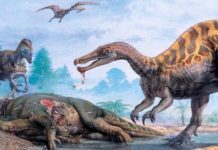 It’s really quite amazing how quickly all of the organisms at this time began evolving – basically doing it for only a period of about 40 million years. And this wasn’t merely simple life either. 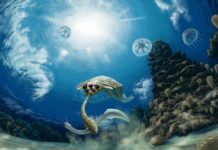 No, a study of Cambrian rocks show that these organisms were employing advanced survival strategies which include burrowing into the ocean floor sediment to escape predation, actively hunting and even making complex interconnected tunnels to live in. 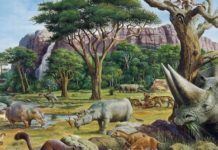 Most of the modern metazoan phylum are represented during this time period, although most of the were represented by classes of animals that have since gone extinct. For instance, Echinoderms were present but they looked nothing like modern starfish or sea urchins but instead looked very alien. Other invertebrates which existed during this time included trilobites, hyolithids, and archaeocyathids. 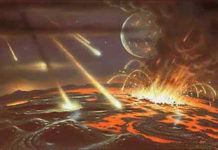 The climate of the Cambrian Period was still cold but was beginning to warm as the glaciers began to recede. Scientists believe that during this time Rodinia broke apart and the melting of the glaciers created shallow seas and tidal pools that allowed life to develop. The constant mixing of chemicals as the ocean waves struck against the land was probably extremely helpful for the evolution of life. This period can be further subdivided into four epochs. These epochs include the Early Cambrian Epoch, the Middle Cambrian Epoch, the Late Cambrian Epoch and the Furongian Epoch. And these epochs can be further subdivided into ten stages.